We’ll post more on what those in your capital are up to as we uncover new bills. Check to see if your state made our past coverage here and here. Democratic Attorney General Tom Miller supports the bill, which will be heard by the Judiciary Committee. It’s unclear who actually sponsored it — sponsor details point to the committee as a whole, though its chairman’s name is included, too. An aggravated misdemeanor can carry two years in prison and as much as a $6,250 fine. Be heard: Iowa legislator contact information can be found here. A bill that would weaken Montana restrictions on who can act as a middleman between insurers and auto glass companies died Thursday in the House Business and Labor Committee. “They tabled it, which is awesome,” said Bruce Halcro, owner of Capital Collision Center, who attended the hearing. from being prohibited from acting as a “glass broker” between fellow auto glass repair companies and the insurer and setting a price at which their peers must work. Behavior from a glass broker was recently scrutinized in Minnesota, which ultimately barred AAA from using Safelite as a middleman in handling glass claims as part of a consent order arranged with AAA. Be heard: Montana legislator contact information can be found here. An Oregon bill which would let customers request any of their original parts back from collision repairers and mechanics following a job will be discussed again by the House Consumer Protection and Government Effectiveness committee at a work session today. The bill by Republican Oregon Rep. Gail Whitsett also requires auto shops to post a sign notifying customers of their rights — including the new one — under Oregon law. The state Department of Environmental Quality said that while parts still have to be disposed of in an environmentally sound manner, there wasn’t any reason why a customer couldn’t have them back so far as its agency was concerned. Darrell Fuller of the Automotive Automotive Trades Association opposed the bill in a letter filed for the hearing, calling the posting an unecessary requirement that would only penalize good shops whose sign is somehow obscured — it fell off the wall, for example — while bad shops who broke the law on giving these details in their estimates would break this law too. He also said there didn’t seem to be any evidence that consumers were having a problem getting parts back in Oregon. “In the very rare event that a shop declines, there are many repair shops nearby who will gladly accept a new customer,” he also wrote. Fuller also noted the bill could cut into the “core” charges which can be recouped by shops in cases where a customer doesn’t request the part back. Be heard: Oregon legislator contact information can be found here. A rule against an insurer using non-OEM parts without written consent would be expanded to every part that isn’t glass under House Bill 2484. The existing bill already requires insurers and repairers to have written consent to use aftermarket parts on any vehicle less than 30 months old and tell any driver with a car that “young” that they have the right to either original equipment manufacturer or aftermarket parts. House Bill 2484 is sponsored by five representatives and has been sent to the Corporations Committee. The language is confusing, but it seems like the existing Rhode Island law also means drivers can’t sign away their right to have OEM parts before a repair. That broader issue was raised by a recent “Anderson Cooper 360” report that highlighted non-OEM language it said was buried within policies. Obviously, a greater expansion of what cannot be replaced with an aftermarket would benefit collision repairers as well as any outside mechanics brought in for work related to a claim. Another Rhode Island bill, whose sponsors include some of the representatives behind HB 5484. could help quality shops distinguish themselves and obtain higher rates for their abilities. House Bill 5491 would create two tiers of auto body shops recognized by the state, “Class A” and “Class B” — and require insurers to provide different labor rate surveys for both levels. The auto insurers would have to explain the formulas behind both tiers’ rate surveys, as they are required to do now for survey of the general collision repair labor pool. 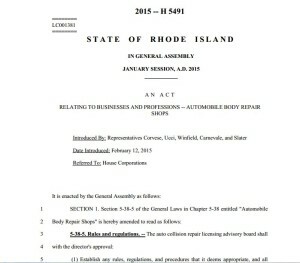 Class Bs would meet the existing collision repair criteria in Rhode Island, as well as anything else the state auto body licensing board ruled in the future would be necessary for both classes. Class A requirements would include the ability to weld aluminum and high-strength steel to OEM satisfaction and with OEM-sanctioned equipment; make 3-D measurements; refinish a car using a prep station, computerized paint mixing, and emissions-reduction equipment; give a limited lifetime warranty; inspect airbags; and do some things that would seem pretty SOP for both tiers, such as have a vehicle lift and meet Environmental Protection Agency requirements. Despite the red tape and expense to make sure your shop reaches the “top shelf,” the bill could be invaluable for shops not involved in direct repair programs who still feel as though they’re being forced into DRP-like labor rates. (The latter was alleged in Crawford’s and K&M v. State Farm and A&E versus 21st Century). The distinction for aluminum and high-strength steel as being worth different rates would also seem welcome for shops seeking to recoup their investment in that type of training and equipment. The bill has been sent to the Corporations Committee. Be heard: Rhode Island legislator contact information can be found here. West Virginia House Bill 2405 would prevent insured customers from having to cover more than $200 in repair costs after hitting a deer on a state highway. Presumably, you’d have to have comprehensive insurance. According to a Crash Network report citing State Farm data, 1 in 39 drivers will hit a deer within West Virginia. The state has been No. 1 for deer-vehicle crashes for eight years running, and the No. 2 state (Pennsylvania) only has 1 in 71 odds. An average deer strike has been estimated as between $2,500 and $4,999 by Carstar shops. Now it’s unclear if this includes larger deer species like moose and elk. But even ramming the average 140-pound West Virginia white-tailed buck at 50+ mph is going to wreak some laws-of-physics havoc upon your vehicle. This could be lucrative for West Virginia collision repairers as deer bills no longer prevent high-deductible customers from getting deer work done. The bill was filed by Democratic Delegate (Rep.) Ralph Rodighiero and has been sent to the House Banking and Insurance Committee. Be heard: West Virginia legislator contact information can be found here.